It is important to remember that God loves us, and wants only what is best for us. While He has given us many lessons that are designed to help us navigate the challenges of daily life, we sometimes forget that His message also contains secrets to a long, healthful life. Author Steve Koulouris has poured through the King James Bible, and he has put together a powerful guide that is designed to revitalize your life and health on a number of profound levels. God’s Health Laws breaks everything down into simple, easy-to-follow terms. This exhaustively detailed guide will give you the secrets to not only making the most of a long life, but how to avoid many of the diseases and conditions that run rampant throughout the United States and the world. The book emphasizes God’s desire for us to take care of ourselves. It then combines this essential fact with tons of information on foods to eat, foods to avoid, and other things you can do. God’s Health Laws is not just backed by His word. 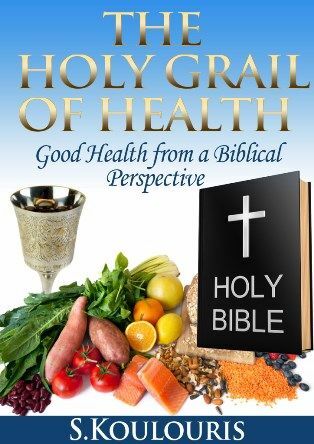 The Holy Grail of Health is also supported by a great deal of science, particularly in terms of what we know about food that is good for us, and food that is not good for us. With this guide, you will have everything you need to take complete care of yourself. By following the rules that are listed in this book, you will be able to feel some significant, meaningful changes to your life and health. The best part about that is how quickly you are going to begin to feel those changes. It will remind you of something very important: When we follow God’s law, our lives are enriched with His love and many gifts. The same thought can easily be applied to God’s health laws, and to the contents of this impressive, unique eBook.